Fort Loramie’s McKenna Mannier goes down while pressured by Anna’s Mary Landis and Breah Kuck during a Shelby County Athletic League game on Saturday in Fort Loramie. Fort Loramie's Taylor Ratermann shoots as Anna's Kiplyn Rowland defends at Fort Loramie Saturday. Fort Loramie's McKenna Mannier gets pressure from Anna's Mary Landis and Ella Doseck at Fort Loramie Saturday. Fort Loramie’s Caitlyn Gasson and Anna’s Michaela Ambos go for a rebound during a Shelby County Athletic League game on Saturday in Fort Loramie. 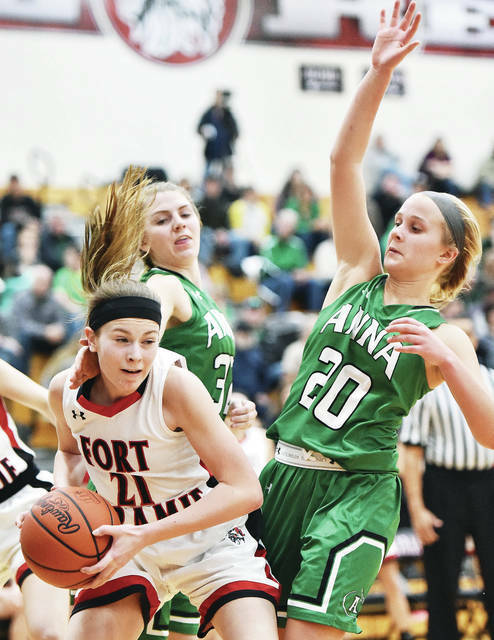 FORT LORAMIE —The first time the Fort Loramie girls topped Anna, the Redskins made “only” six three-pointers. Taylor Ratermann drilled one in each quarter. Kennedi Gephart added two more. In the return match on Saturday, five different Redskins buried a total of ten triples. Ratterman and Gephart each hit three from range. And a trio of girls came off the bench to also make shots from behind the arc. Jadyn Puthoff canned two; Macy Imwalle swished one; and Corynn Heitkamp knocked down another. The Saturday result: Fort Loramie 59, Anna 19. 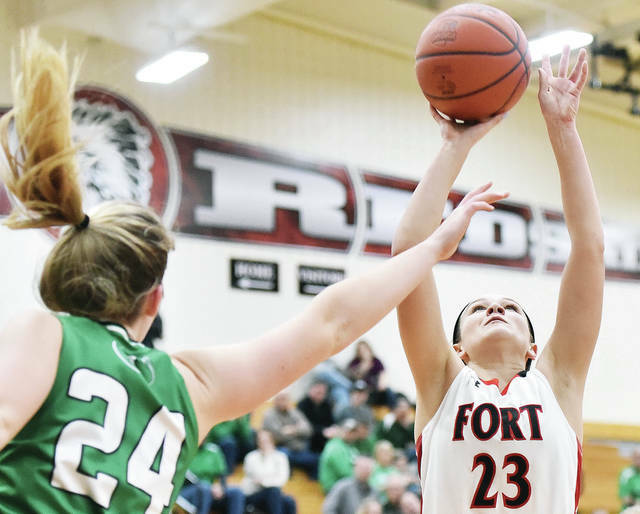 This outstanding shooting from distance helped to separate Fort Loramie from Anna again, as the Redskins swept the season series and took the Shelby County Athletic League crown for the fifth time in six years. Fort Loramie is 11-0 in the SCAL and 19-1 overall with a league game remaining versus Botkins on Thursday. Anna concluded its league season on Saturday with a formidable, second-place mark of 10-2 and is 15-4 overall. In Saturday’s early going, the Rockets were able to zone and slow the pace of the game much like the initial clash between the clubs. But in this outing, the Rockets stayed close for only four minutes, not the full four quarters like they did on January 3 when Fort Loramie staved off Anna, 43-35. 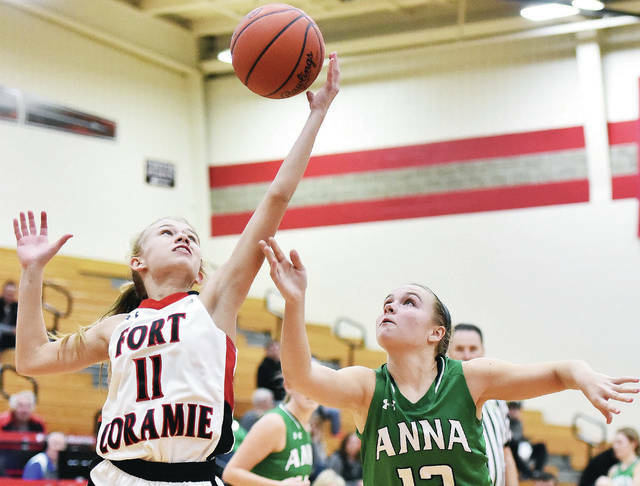 Thanks to a quick two-point jumper by Michaela Ambos, Anna struck first in Saturday’s matinee at Fort Loramie and still led 4-2 after one-half of the opening quarter. The Redskins missed five of their first six shots. Anna then slowly but surely succumbed, like most all teams, to Fort Loramie’s waves of pressure. The Rockets made numerous live-ball turnovers enabling the Redskins to score 32 of the next 40 points in less than a dozen minutes. Gephart’s back-to-back three’s spurted Fort Loramie to a 15-4 lead after a quarter. Seven different Redskins tallied points by halftime, and nine recorded at least a point by the end of the third period. Anna repeatedly, with some success, dumped the ball inside to 6-2 Lauren Barhorst, who scored five field goals for the game, including three in the second period. Barhorst, in fact, registered 24 points in the two contests versus Fort Loramie this season. Maurer added that his squad needed to combine Barhorst’s strong performance with solid ball handling on Saturday. Anna did a pretty good job limiting its mistakes in the first round tilt against the Redskins. 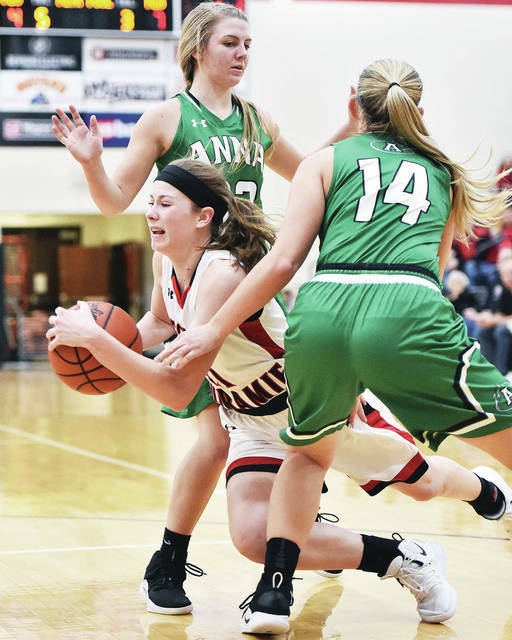 In the end, however, Anna’s excessive turnover total and Fort Loramie’s blistering shooting from behind the line spelled the difference on Saturday. An Achilles heel for the Redskins last season, perimeter shooting is one of its many strengths in 2019. Only three girls recorded points for Anna. Barhorst produced 10; Kiplyn Rowland, 7; and Ambos, 2. For Fort Loramie, Ratermann and Gephart split 26 points down the middle. Kenzie Hoelscher added 8; Puthoff, 7; Imwalle and Corynn Heitkamp, 5 each; and Riley Heitkamp, Caitlyn Gasson, Dana Rose and Marissa Meiring, a two-point basket apiece. The Redskins blanketed Anna’s Ella Doseck and held her to two attempted shots from the floor. Both teams are poised to represent Shelby County extremely well in the post-season and make deep tournament runs. The resume for the D-III Rockets includes victories over two strong sectional teams, Miami East and Versailles. Anna has beaten three Midwest Athletic Conference foes. Meanwhile, D-IV Fort Loramie has won six games over D-III opponents. It has swept all five MAC clubs on its schedule and aims for a sixth victim, Marion Local, on February 12. The Redskins should continue their hold on the number one state ranking in this week’s D-IV AP Poll. Fort Loramie’s Taylor Ratermann shoots as Anna’s Kiplyn Rowland defends at Fort Loramie Saturday. Fort Loramie’s McKenna Mannier gets pressure from Anna’s Mary Landis and Ella Doseck at Fort Loramie Saturday.